Evo FG Flush Mounted Lights – suit all fibreglass and above-ground vinyl pools. They are simple to install and fit through a 60mm hole. Competitively priced and Australian made. 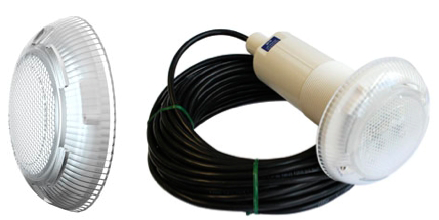 Low profile, compact niche light, supplied with 20m cable. 1.2 metres of cable is factory fitted into the niche, allowing the light to be installed below ledges for maximum pool illumination. Super bright, energy efficient, long life. Available in fixed colours of white, blue or green as well as the multi-colour option which includes the integrated Colour Selection Palette allowing the user to choose from an infinite variety of fixed colours and programming modes.